Twenty rowers were rescued from the River Tyne after they got into difficulties in treacherous conditions. 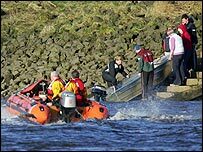 The Edinburgh and Durham University students were experiencing problems caused by strong currents and high winds on the river at Newburn. A rescue boat was launched but it became swamped. The Tynemouth RNLI inshore lifeboat was alerted by the Humber Coastguard and joined a police launch and fire service launch to bring the rowers to safety. David Nugent, RNLI inshore lifeboat helmsman said: "When we got to the scene some of the rowers were still unaccounted for so we started searching the river with launches from the police and fire service. "Eventually all the rowers were found and taken to safety although two of them had to be taken to hospital. "The conditions on the river were terrible and it could have been much worse. I'd say they were very lucky".